bestselling psychological thriller In the Woods. Six months after the events of In the Woods, Detective Cassie Maddox is still trying to recover. She's transferred out of the murder squad and has started a relationship with Detective Sam O'Neill, but she's too badly shaken to make a commitment to him or to her career. Then Sam calls her to the scene of his new case: a young woman found stabbed to death in a small town outside Dublin. The dead girl's ID says her name is Lexie Madison -- the identity Cassie used years ago as an undercover detective -- and she looks exactly like Cassie. With no leads, no suspects, and no clue to Lexie's real identity, Cassie's old undercover boss, Frank Mackey, spots the opportunity of a lifetime. They can say that the stab wound wasn't fatal and send Cassie undercover in her place to find information that the police never would and to tempt the killer out of hiding. At first Cassie thinks the idea is crazy, but she is seduced by the prospect of working on a murder investigation again and by the idea of assuming the victim's identity as a graduate student with a cozy group of friends. As she is drawn into Lexie's world, Cassie realizes that the girl's secrets run deeper than anyone imagined. Her friends are becoming suspicious, Sam has discovered a generations-old feud involving the house the students live in, and Frank is starting to suspect that Cassie's growing emotional involvement could put the whole investigation at risk. 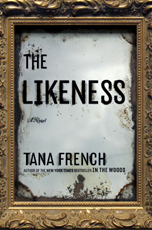 The Likeness is another gripping psychological thriller from an author who has proven that she can deliver.